MORE than 150,000 doses of the hendra virus vaccine have been administered to horses across Australia since it was introduced last year. The vaccine is widely regarded as the most effective tool against the deadly disease. It provides at least six months of protection for horses from contracting the virus and passing it on to other horses and humans. Minister for Agriculture, Fisheries and Forestry John McVeigh praised Queensland horse owners on Wednesday who had made the decision to have their animals vaccinated against the deadly disease. "Horse owners should not become complacent even after vaccination," he said. "The Queensland Government still recommends the use of good personal hygiene and biosecurity measures when working with horses, regardless of their vaccination status. "Horse owners should discuss vaccination with their veterinarian and familiarise themselves with other measures to reduce the risk of hendra virus infection." 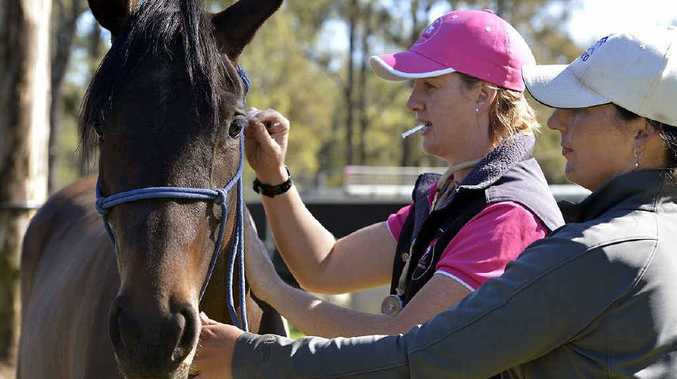 CSIRO's lead researcher Dr Deborah Middleton said she was pleased to see the number of horses being vaccinated had increased in the past five months. "As a veterinarian, it is great to see how supportive the industry has been of the vaccine," she said. "I have seen first-hand how hendra has created difficult working conditions for my colleagues and greater uptake of this vaccine will not only make their working lives easier, but it will also help protect them and their staff from a potentially fatal hendra infection." The vaccine was made available in Australia for first-time on November 1, 2012.